Our friends at Michael K Chen Architecture: MKCA have undertaken a renovation of the interiors of a seven-storey townhouse with two stairwells, and adding new glazing to draw light from a rooftop patio. The footprint of the Neo-Grec building (1879) was expanded to 9,600 SqFt, and it now has five bedrooms; at one point the building was divided into 17 apartments. 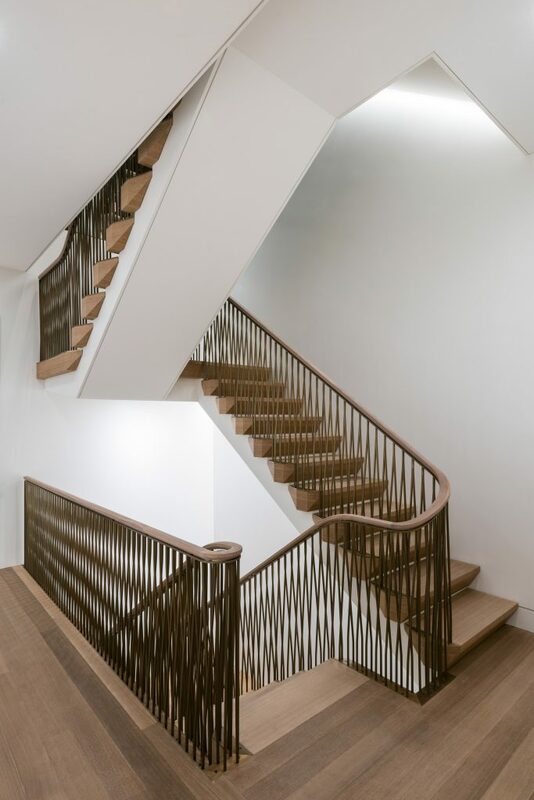 The office added a stairwell with irregularly shaped edges which extent behind the railings with handrails of thin braided bronze rods—and, among other interventions: an elevator, double-height windows, white surfaces and herringbone floors, as well as contemporary touches.